So, here's the latest on my saga with Aerogarden strawberries. If you recall, I planted my strawberries into my Aerogarden ULTRA as soon as I got them on 9/9. One plant grew nicely but the others were just dried out twigs (in fact, some of them disintegrated into dust when I snapped them in half). The customer service rep insisted that they were in a "dormant" state and they'd germinate eventually, sort of implying that I should be a little more patient and give it more time. 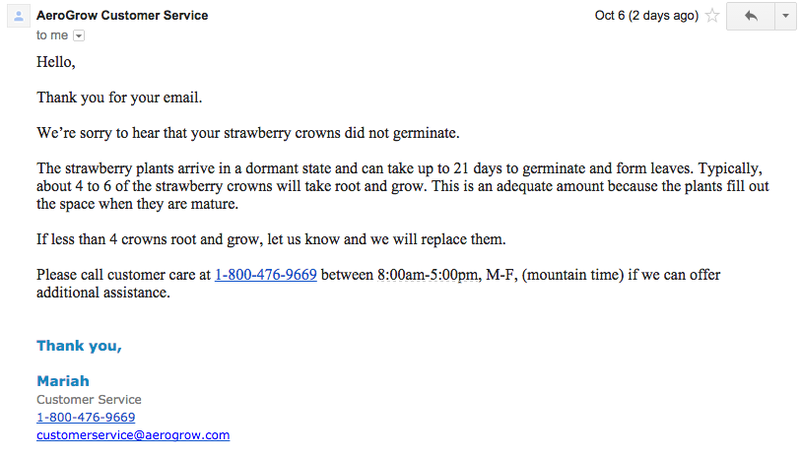 But that said, she was kind enough to go ahead and send me a replacement set of crowns, no questions asked. The replacements arrived on 9/20. The new batch seemed as dead as the other ones, but I threw caution to the wind and planted them. Both packages had been sent UPS Surepost, meaning they were kept in warehouse for multiple days before getting sent to the US Postal Service for delivery. I was ready to get upset, but no sooner did I get the email above that I got an order confirmation in the mail saying the rep had placed a replacement order of new crowns for me. And happily, this time instead of going UPS Not-So-Surepost, they were going UPS Ground. Sure enough, I received the order in four days--on 10/10/14. I felt vindicated in writing to Aerogarden at 16 days because after exactly 21 days (okay, 20 days and 15 hours), the new set of plants clearly never grew. Now ironically, the one plant that grew from the original batch is actually doing really well. In fact, when I looked more carefully, I can already see a little strawberry forming! Odd because I didn't even notice there was a flower there. But of the replacement set of crowns, not one grew. The only thing close to green is a layer of green algae that's forming on a couple of the plants (at least I hope it's algae). I opened the new box as soon as I got it. Once again, the crowns didn't look quite like the picture on the Web site, but came wrapped in a plastic bag. But right away I felt a difference. While the other two orders were dusty and dried out, feeling the roots through the plastic bag, they were soft and pliable. Similarly, when I took the crowns out, unlike the other two shipments which crumbled at the touch, I was able to separate nine distinct roots. Looking close-up, you can see that all of them have a little green in them and they look much healthier than the dried-out disintegrated twigs I showed you last time. I carefully planted all of them. For some reason it seemed like there was less Coco Chunk than before (perhaps they shrunk as they soaked up water) but thankfully my original Grow Bowl kit had come with more than enough to replenish it. I also did a complete Rinse and Refill using my new siphon, and refilled the unit with fresh water and nutrients. So here's what the strawberry garden looks like now. Let's see in a few days if the third time is a charm.